Mumbai, Oct 23 (IANS) Healthy buying in telecom and oil and gas stocks along with positive global cues lifted the Indian equity markets on Monday. The healthy off-take in the two sectors was led by Airtel and Reliance Industries. Consequently, the 30-scrip Sensitive Index (Sensex) closed 117 points or 0.36 per cent higher. 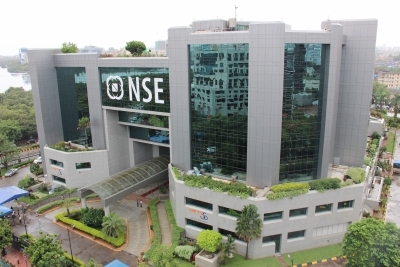 Similarly, the wider 50-scrip Nifty of the National Stock Exchange (NSE) closed on a positive note. It edged higher by 38.30 points or 0.38 per cent to close at 10,184.85 points. The Sensex of the BSE, which opened at 32,411.86 points, closed at 32,506.72 points, higher by 116.76 points or 0.36 per cent from its previous close at 32,389.96 points. The Sensex touched a high of 32,614.89 points and a low of 32,312.74 points during the intra-day trade. “Markets ended with healthy gains on Monday after bouncing back from the Nifty lows of 10,124 points. Positive global cues supported gains on the domestic bourses,” Deepak Jasani, Head – Retail Research, HDFC Securities, told IANS. According to Dhruv Desai, Director and Chief Operating Officer of Tradebulls, Monday’s rise was on the back of gains made by the telecom stocks after Reliance Industries Ltd’s unit Jio raised data tariffs last week. “Bharti Airtel stock has gained 24 per cent over the past 10 trading sessions, despite the competitive pressure and regulatory headwinds in the telecom segment… Over the past 12 months too, the stock is up from Rs 307 level to Rs 471 at Thursday’s close, even while Reliance Jio entered the sector last September and offered free services till recently,” Desai said. In terms of investments, provisional data with the exchanges showed that foreign institutional investors (FIIs) sold scrips worth Rs 81.51 crore while domestic institutional investors (DIIs) purchased stocks worth Rs 307.84 crore. On the currency front, the rupee remained flat. It inched up by 2 paise to close at 65.02 against the US dollar from its previous close at 65.04. Sector-wise, the S&P BSE oil and gas index surged by 129.38 points, followed by IT index by 93.15 points and metal index by 68 points. On the other hand, the S&P BSE healthcare index fell by 90.05 points, FMCG index by 67.21 points and capital goods index by 40.68 points. Major Sensex gainers on Monday were: Bharti Airtel, up 4.99 per cent at Rs 497.50; Reliance Industries, up 3.05 per cent at Rs 938.10; ICICI Bank, up 1.82 per cent at Rs 262.55; Wipro, up 1.63 per cent at Rs 296.60; and Hero MotoCorp, up 1.40 per cent at Rs 3,790.40. Major Sensex losers were: Tata Motors, down 2.71 per cent at Rs 234.80; Cipla, down 2.38 per cent at Rs 593.70; Axis Bank, down 2.27 per cent at Rs 449.90; Kotak Bank, down 1.61 per cent at Rs 1,061.95; and HDFC, down 1.52 per cent at Rs 1,720.90.